The President of the Senate, Bukola Saraki, has arrived the courtroom of the Code of Conduct Tribunal in Abuja to face trial over a 13-count charge of corruption levelled against him by the Code of Conduct Bureau. Mr. Olaniyonu however declined further comments, saying he was already seated in the courtroom. Some of the senators in court, according to a 3m360 reporter at the trial, are Theodore Orji, Sam Egwu, Ike Ekweremadu, Shaba Lafiaji, Aliyu Wamakko, Rafiu Ibrahim, Tayo Alasoadura, Hamma Misau, Samuel Anyanwu, Sabi Aliyu Abdullahi, among others. The Chairman of the Tribunal came into the courtroom at 10.32 a.m, and apologised for the delay in the commencement of proceeding. He said the tribunal was sorting out some matters. This newspaper learnt that the Senate President and his supporters first converged on the National Assembly early on Tuesday morning from where they took off in a convoy of buses for the tribunal. One of the senators, who asked not to be named, said he and his colleagues decided to provide cover for the senate president to prevent him from being arrested or humiliated by the police. A supporter of the Senate President, now also inside the courtroom, told 3m360, “We are already seated. No shaking. The plan is to humiliate the man, not minding if they break the law or violate the procedure. Mr. Saraki had on Monday released a statement, saying he was now ready to attend his trial, days after he battled frantically to use the courts to halt the trial. The tribunal had ruled Monday that Mr. Saraki must appear before it at 10am today. Mr. Saraki failed to appear before the tribunal during Monday’s sitting despite an arrest warrant issued against him by the tribunal last Friday. He is facing charges bordering on corruption and false assets declaration. The tribunal opened the trial last Friday but the senate president failed to show up. He was represented by a team of lawyers led by a former president of the Nigeria Bar Association, Joseph Daudu. Consequently, the Chairman of the Tribunal, Justice Danladi Umar, ordered the Inspector General of Police, Solomon Arase, to effect the arrest of the senate president and produce him before the Tribunal on Monday. Mr. Saraki’s lawyers immediately filed a suit at the Court of Appeal for a stay of execution. Despite the appeal, the Tribunal resumed the trial on Monday without the senate president appearing. At the hearing, Mr. Saraki’s lawyers objected to the sitting contending that the Tribunal was incompetently constituted. They argued that the 1999 Constitution provided that the Tribunal can only sit with three of its members, namely the chairman and two members present as against two – chairman and one member – which was the case when the trial resumed. However, Mr. Umar responded by referring to the Interpretation Act, which says the chairman and one member could sit during any trial. The police had said weekend that it did not receive any order on Friday requesting it to arrest Mr. Saraki. The Catholic Church of Annunciation, Kubwa, was upgraded as a Parish by the Archdiocese of Abuja and less than 3 months after the upgrade, suspected armed robbers stormed it and carted away valuable equipment and a Toyota Camry. The robbers forced their way into compounds and carted away whatever they could lay their hands on. Former Presidential candidate and chieftain of Afenifere Olu Falae has been kidnapped. He was reportedly kidnapped at his home on Oba-Ile Road, Akure, the Ondo state capital this afternoon. The police and all security agencies in the state have launched a manhunt for his kidnappers. Olu Fale ran for presidency on the joint platform of the Alliance for Democracy (AD) and the All People’s Party (APP) in 1999. Diego Costa has been branded a “cheat” – by one of his OWN team mates. Chelsea defender Kurt Zouma made the amazing remark in a post-match TV interview which will only turn up the heat on the bad-boy striker. 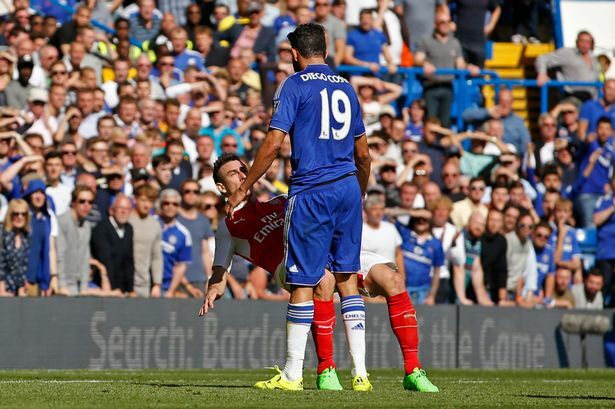 Costa is waiting to hear whether he will be hit for a retrospective ban by the FA after his bust-up with Arsenal defender Gabriel who was sent off in the clash at Stamford Bridge on Saturday. DJ Led shuts down all clubs with the heaviest weights in the industry banging on your speaker, listen to the electric vibes from clubstar lil kesh, dj xclusive, davido, rihana,wande cole, patorankin, dj led,olamide,reminise,suki, etc . Chief (Mrs) Hannah Idowu Dideolu Awolowo, the matriarch of the Awolowo family and wife of late Obafemi Awolowo has died. She passed on in her sleep today September 19th at her Ikenne, Ogun state home at age 99, just two months before turning 100. She was born on November 25, 1915. May her soul rest in peace, Amen.